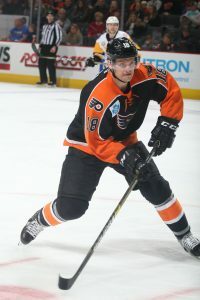 Lehigh Valley, Pa. – The Lehigh Valley Phantoms (35-30-4-3) returned home to a sold out PPL Center and secured a 4-2 win over the Wilkes-Barre/Scranton Penguins (35-26-7-3). 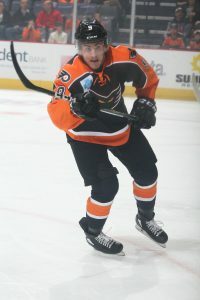 Despite not having a power play in the contest, Cole Bardreau scored two shorthanded goals to help power the Phantoms to victory. Tyrell Goulbourne and Byron Froese also scored for Lehigh Valley and Alex Lyon made 33 saves to secure his 17th win of the season. The Phantoms returned from the long road trip and scored just 7:35 into their homecoming. Usually a thorn in the Penguins side physically, Tyrell Goulbourne did the damage on the scoresheet early in this one with his ninth goal of the season. James de Haas cycled over to the point and fired a shot on net that a leaping Goulbourne was able to redirect past Tristian Jarry while in mid-air. Byron Froese picked up the secondary assist on the play to extend his career-best points streak to seven games. He has points in all five games against Wilkes-Barre/Scranton since joining Lehigh Valley. With Wilkes-Barre/Scranton on the first power play of the game, the Phantoms scored their second goal of the game, as Cole Bardreau scored his team-leading third shorthanded goal of the season. Bardreau forced a turnover in the neutral zone and then out-muscled a Penguins defender and slid a shot through the five-hole of Jarry to give the Phantoms a 2-0 lead. The Penguins answered to make it a one-goal game again just a little over a minute later as their leading-scorer Ryan Haggerty potted his 23rd goal of the season. Haggerty snuck behind the defense and Sam Lafferty found him for a one-time blast to make the score 2-1. Lafferty and Haggerty have led the Penguins against the Phantoms, picking up their 12th and 10th point in the rivalry series. It wouldn’t be a Lehigh Valley and Wilkes-Barre/Scranton game without some extra-curricular stuff after the whistle. Nic Aube-Kubel and Sam Lafferty dropped the gloves just 36 seconds into the middle frame and Aube-Kubel took down Lafferty with one shot. 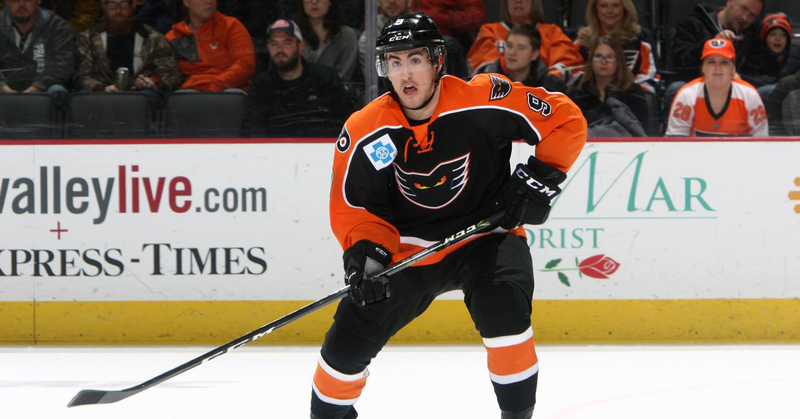 Cole Bardreau showed why he is the Phantoms top penalty-killing forward as he scored his second shorthanded goal of the game to give Lehigh Valley a 3-1 lead just 2:10 into the second period. Carsen Twarynski got free on a scoring chance with the Penguins on a power play but Jarry got his blocker on the shot and the puck fluttered into the air. A streaking Bardreau cleaned up the rebound and scored his seventh goal of the season, four of which have been shorthanded. Bardreau’s four shorthanded goals tie him with Scott Laughton for the most in a season by a Lehigh Valley player. The Phantoms extended their lead to three on one of the prettiest goals we’ve seen all year. Byron Froese corralled the puck below the red line and wheeled around the back of the net with the puck on his backhand. He wrapped around in front and flipped one off the skate of the Penguins netminder and in for his 20th goal of the season. Froese has 10 points (4g, 6a) during his seven game point streak. Wilkes-Barre/Scranton would get one back with 5:38 remaining in the third. Chris Summers fired a shot from the point that was kick away with a pad save by Lyon but Brandon Hawkins was there to finish the rebound. Lehigh Valley would shut the door after that and hold on to win 4-2 in the first of back-to-back against the Penguins. NEXT TIME OUT: The Phantoms will battle the Wilkes-Barre/Scranton Penguins for the 12th and final time tomorrow at 3:05 in the first Sunday showdown between the two Keystone State rivals.